Bangalore, 25th May, 2018: RealMe, the new e-commerce sub-brand of smartphone giant OPPO, sold units out within 2 minutes of its first sale. The sale that was announced at noon today on Amazon.in, received great response for its first two variants 6GB RAM+128GB ROM, launched at INR 13,990/- and 3GB RAM and 32GB ROM version at INR 8,990/-, making it the Best Seller on amazon.in. 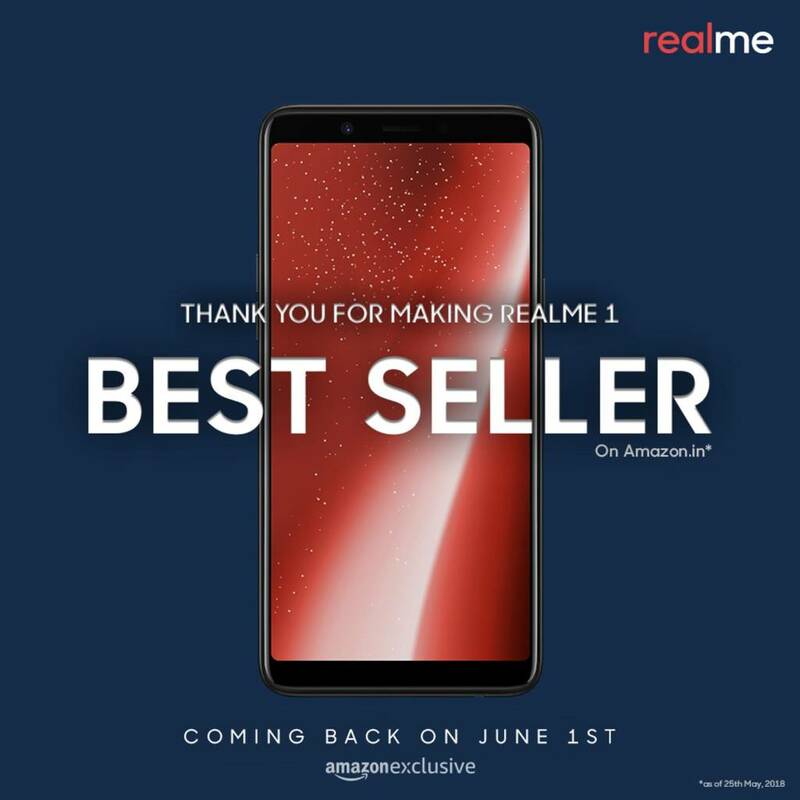 The next sale of RealMe 1 is scheduled on June 1st, 2018. In terms of specifications, RealMe1 has a phone’s screen body ratio of almost 85% and bezels less than 1.98 mm that offer the most intuitive full screen experience. Its unique Diamond Black design replicates an effect of suspended three-dimensional Sapphire. The Mediatek’s HelioP60 NeuroPilot AI technology, gives the device an enhanced edge, particularly in photography, real-time beautification, real-time video preview. A 6GB RAM that allows users to run as many as 20 apps at one go without hanging and a 128 GB ROM ensures that users enjoy uncompromised storage. The phone’s 3410mAh battery + AI battery management promise + the sharp AI processor ensures that longer and higher usage doesn’t affect its performance or heat up the phone. The enhanced Facial Unlock function can accurately identify 296 facial points to provide better security and takes less than 0.1 secondsto unlock your phone, even in low-light conditions. The ColorOS 5.0 UI based on Android 8.1 has been completely revamped with a brand new and fresh interface design that is easy on the eyes. The 13MP rear camera also features the AI Scene Recognition which can intelligently and accurately identify different scenes and objects in real-time. In all, RealMe 1 offers customers the best, with respect to price and performance. Manufactured by OPPO factories, the brand will offer beautifully designed and power packed choices of extremely high quality in sub INR 15,000 range. RealMe customers will have access to over 500 OPPO service centers across India with guaranteed 90% of repair cases resolved within an hour. Along with online service supports, RealMe is offering a 360-degree customer service system.